Tom joined the team at the completion of the 2006/2007 athletics season. He enjoyed the new training structure and also lost substantial kilograms in his first pre-season demonstrating a strong improvement prospect. He has ceased competition and training due to other interests and commitments. He is a drummer in a band which plays in metropolitan Melbourne. He maintains regular contact with the team and continues to support the team members and attend team social events. He has resumed training in an attempt to regain some fitness. He remains eligible for novice events. He was a member of the Ringwood Athletic Club. Pro Debut : 2007/2008 Northcote 70m Novice. Chris has been a long servant of pro running and amateur running. He has had extensive success as an amateur athlete with the Box Hill Athletic Club and has also been successful in the pro ranks with wins including the Bendigo Gift and Keilor Gift. Chris is predominantly a 100m sprinter, however can run fairly well over the 200m distance aswell. After the Bay Sheffield in season 04/05 he contacted Nick Fiedler and joined the team. He was initially under a 28 day suspension for accepting in the invitation backmarkers at the Bay Sheffield but was unable to take his place in the race due to severe cramping. Upon return to racing he took a while to find his feet, but started to show some form at Noble Park and Burramine where he made both Gift finals. He has had an extensive winter preperation, however he unfortunately suffered a major setback at the Bay Sheffield in 05/06 where after he made a blinding start in the heat of the 70m and had the field already covered after 15m when he broke down. Examination appears to be multiple tears through the glute, hamstring and adductor. He did not race after that injury until Ringwood 06/07 where he was clearly lacking confidence and conditioning. He is on a very limited training programme due to work and family committments and to also ensure a similar injury does not occur again. Hopefully he can recapture some of the form that he showed glimpses of just before he got injured in the coming seasons before he retires. He is not registered with any amatuer club but was formerly with Box Hill Athletic Club. Pro Debut : 1993 Caulfield 120m Gift. 1st Keilor 120m Gift, 1st Sunbury 100m Gift. 3rd Tullamarine 120m Gift, 3rd Rye 120m Gift, 3rd Prahran 100m Gift. Also winner of Stawell 120m Backmarkers Invitation. (Year to be determined). Emma approached Nick Fiedler nearing the end of Season 05/06 to see whether she could train with him. She was moving work locations to the Eastern suburbs and she wished to make her athletics also fit in with her career. She was previously coached by Terry McGarity and John Henry where she had much success. Since joing the team her success has continued going on to make the Stawell final another two times from lesser marks and also gone on to win a further 11 races. She showed a tremendous training ethic and improved dramatically to run from much lesser marks in her latter years whilst still continuing her success. Her team focus and commitment is outstanding. 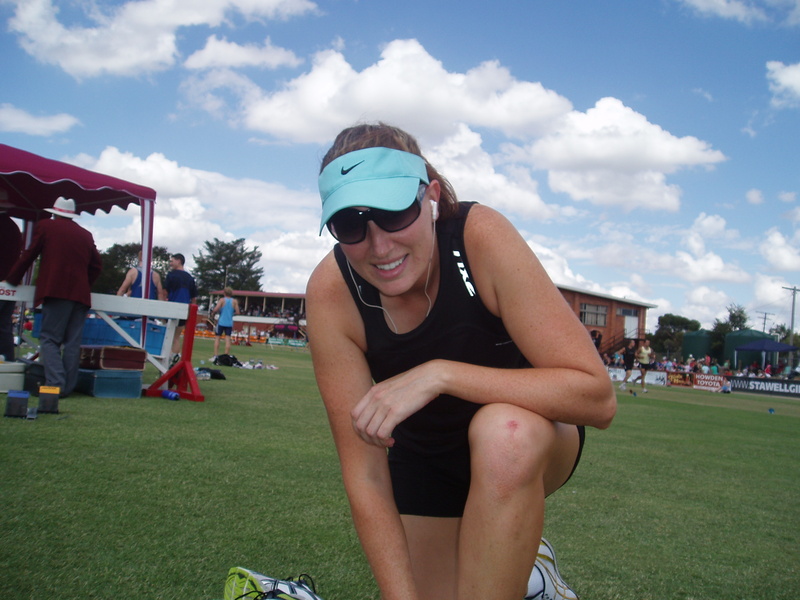 She was diagnosed with a career ending foot problem at the end of season 2008 and has had surgery to rectify that problem but the risks of further injury are too great to justify a return to athletics competition. As a result she has taken up the sport of curling, and is learning the ropes witha view to international competition. Although not training or competing in athletics she remains a team member of the squad. 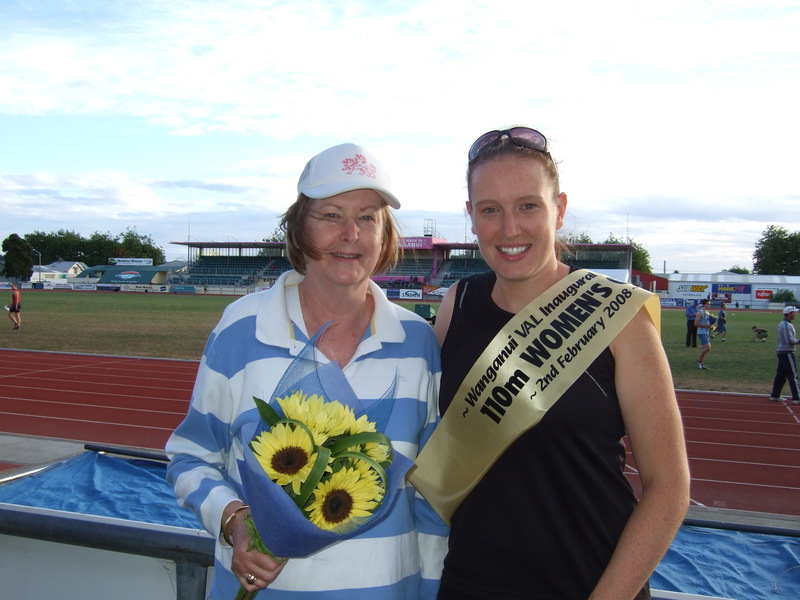 Emma with her mum at 2008/2009 Wanganui Womens 110m presentation. Pro Debut : Womens 400m at Tullamarine in 1997. 1st Dandeonong Womens/Veterans 300m, 1st Cranbourne Womens 400m, 1st Maryborough Womens 400m, 1st Ararat Womens 100m, 1st Keilor Womens 400m, 1st Wanganui Womens 110m, 1st St.Bernards Womens 300m. 2nd Geelong Greyhounds Womens 300m, 2nd Ringwood Womens 100m, 2nd Wanganui Womens 1600m, 2nd St.Bernards Womens 120m. 1st Zatopek Open 400m, 1st Ringwood Womens 100m, 1st Casey Womens 120m, 1st Geelong Womens 100m. A full list of her achievements is still being compiled. Kim is definately one of the quiet achievers of the team. She is diligent in her training and quite often you wouldn't notice she is there, but she is regularly working away with not much to say. She was originally a 100m hurdler and long jumper with the Ringwood AC. She has gone from strength to strength in recent years. She was introduced to po running by Nick Fiedler in 97/98 and after making a few finals she pursued other goals and left the running scene to travel overseas. Upon return she had lost much condition and it wasn't until a phone call from Nick Fiedler sprung her back into action. He had demanded to see her back at training the next night. She returned to training the next night and hasn't looked back since making constant improvement over all distances. Initially there was no requirement to return to amateur competetion which she had lost her passion for, but after a season she was encouraged to embrace amateur comp aswell and has returned to this racing format aswell. Kim retired at the completion of Rye 07 where she made the final of the womens 120m where she had been runner up in the 3 previous years. She then went overseas but has now returned and commenced training recently to keep fit. Who knows, she might reconsider her retirement to compete again this season. 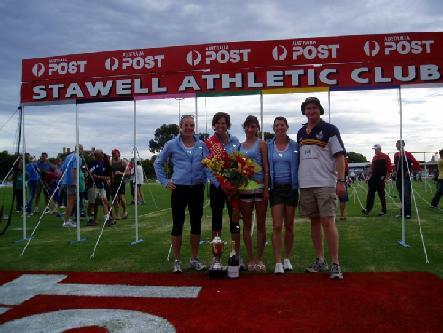 Kim after winning the 2002/2003 Stawell Womens 100m. (With Anne, Alice, Katie and Nick). Pro Debut : 1997 Strath Creek Womens 100m. 2nd Dandenong Womens/Vets 300m, 2nd Maryborough Womens 120m. 1st Noble Park Open 70m. 2nd Rye Womens 120m, 2nd Ballarat Womens 120m. Winner of Frank McHugh Trophy for best athlete of Bay Sheffield Carnival. Winner of Stawell "Fashions on the Field". 1st Stawell Womens 400m, 1st Ballarat Frontmarkers 400m. 1st Stawell Womens 100m, 1st Moonee Valley Womens 200m. Andrew is a well established athlete who has tasted much success as an amateur and professional athlete. He approached Nick Fiedler at the completion of Season 2006/2007 with a view to changing his training program and re-inventing himself for his future athletics pursuits. In 2007/2008 season he had a major injury blow at Latrobe in December where he ruptured his achilles. He has rehabilited his achilles, but does have some ongoing complications. He finished up with the team in the following season moving on to do his own training and programme. He is a member of the Box Hill Athletic Club. Pro Debut : Torquay 400m in 1992. (A full summary is being prepared). Tiwana has had a limited track and field background but has played extensive basketball throughout her life and continued to play basketball. She enjoys all sports and her occupation is an Outdoor Education and Lifeskills Teacher based at Marlo. Tiwana joined Team Fiedler in June 2007 with a view to getting fit and resurrecting her athletics passion. She enjoyed her first year with reasonable success making three individual finals at Stawell (Novice 100m, Womens 120m, and Womens 400m). She also made a number of other major finals including VRTA Womens 400m, Mt.Gambier Womens 120m, Rye Womens 400m, Ringwood Womens 400m, Ballarat Womens 120m, Keilor Womens 120m, Keilor Womens 400m, Bendigo Womens 120m, Bendigo Womens 400m, St.Bernards Womens 120m. She was a member of the Williamstown Athletic Club. In August 2008 whilst playing basketball she landed awkwardly and ruptured her achilles. She requried surgery followed by extesnive rehab before there is any prospect of her returning to the track in the near future. Although not currently training or competing she still has close ties with the team and is still part of the social team events. Tiwana has resumed training whilst living in remote Marlo in Victoria's far East. She hopes to resume some fitness, compete when she can and hopefully again become competitive. 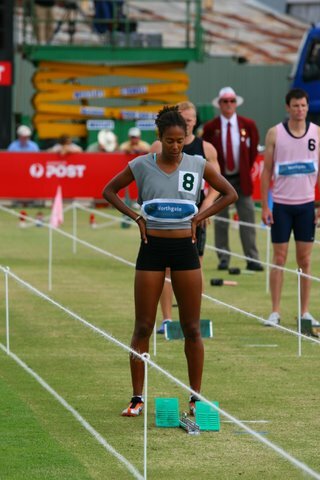 Tiwana before the 2007/2008 Stawell 100m Novice Final. 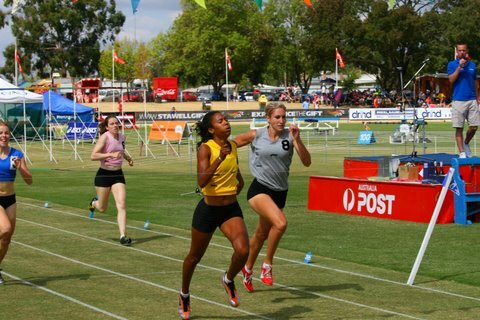 Tiwana winning her heat of the Womens 400m at Stawell 2007/2008. Pro Debut : 2007/2008 Dandenong 300m Womens/Veterans.